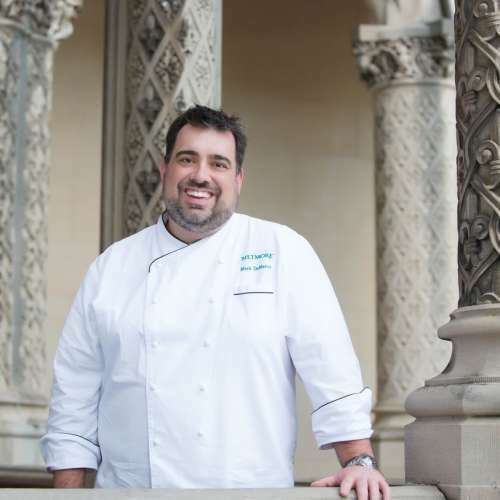 Chef Mark DeMarco is Estate Executive Chef at Biltmore in Asheville N.C. Food has always been an important part of life for Chef Mark, as his grandmother owned a pizzeria and catered out of his childhood home. A 1999 Graduate of the IUP Academy of Culinary Arts in Punxsutawney, PA, Chef Mark worked at The Grove Park Inn Resort & Spa in Asheville before beginning his Biltmore career at the estate’s Bistro in 2004. Chef Mark helped open Cedric’s Tavern in the estate’s Antler Hill Village in 2010 and became Executive Chef. Today, Chef Mark serves as Estate Executive Chef, overseeing the estate’s non-lodging restaurants that source estate-raised food from Biltmore’s field-to-table program that includes a production garden; vineyard; free-range beef, lamb, poultry, and swine program; eggs; and partnerships with farmers throughout Western North Carolina.